Lying 400 miles south of India, the Maldives are an idyllic paradise, with clear blue water and great visibility. Northwest of Male, the capital of the Maldives lies the Baa Atoll, where Hanifaru Bay is. 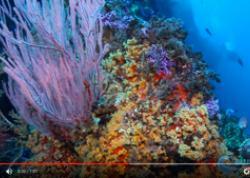 I almost fell off my seat when I watched the footage from Hanifaru Bay in the Maldives a couple of months ago. Holy c**p I thought, I've never seen big animal action like that anywhere. 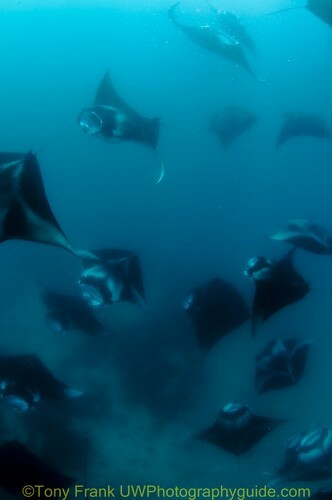 We're talking dozens and dozens of huge manta rays feeding. Up to 200 mantas at a time. Not just Mantas, but also whale sharks, opening their huge mouths and gulping in food. Still underwater photography cannot properly capture the beauty of the marine life here, you need to see underwater video. Many underwater photographers have recently excellent video with the Canon 5DMKII and Canon 7d of the manta rays and whale sharks at Hanifaru Bay, using a wide fisheye lens like the Tokina 10-17mm lens. 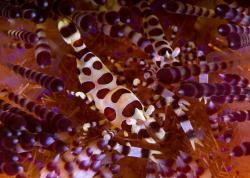 There's not a lot in the area other than the Mantas and the Whale sharks. Even then, when they do enter the bay, it will be for an hour or two at a time. Quite a distance away there are areas of the Maldives with beautiful soft corals and schools of fish, although macro subjects are generally not as common as southeast Asia. 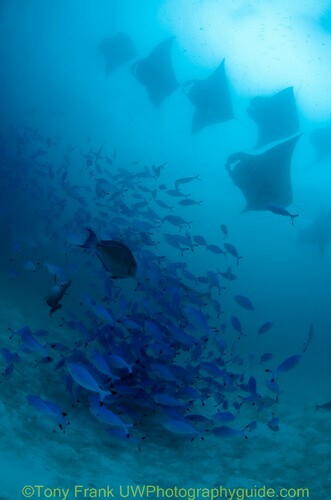 When the manta rays don't enter the bay, you can still see them on many dives at cleaning stations, but they will be more skittish than when they are feeding. "Feeding season" is considered to be from May to November, but I think the best time to visit is late July to early October. Conditions have to be just right for the whale sharks and manta rays to enter the bay, so I would go for at least 10 days to ensure you see the "action". In that time period you should get at least a couple days where the pelagics enter the bay. Most people fly through Singapore or Dubai, and stay overnight in a hotel in the Maldives capital, Male. I've heard you can get more baggage allowance going on the Dubai flights. The next morning your boat or resort will pick you up. If you are at a Manta cleaning station, never chase or charge the manta rays, it won't work. Wait for them to come to you. Don't rise up to their level. I can't believe the different opinions people have had of the Maldives. Some people have a fantastic time, and some people have an ok time. The quality of the resorts, boats and dive sites can vary tremendously. It's important to research the Maldives very carefully, including when and where you go. Some dive operations and boats mainly cater to inexperienced divers, and some areas of the Maldives have extensive coral bleaching. The Maldives can offer a fantastic topside and underwater experience but be sure to spend extra time researching the boat/resort, and the dive areas that will be covered on your trip. Submitted by m (not verified) on Tue, 2010-10-19 16:07. Thanks to your wonderful website and this article, I was able to take a decent photo when I went to Hanifaru Bay last month. 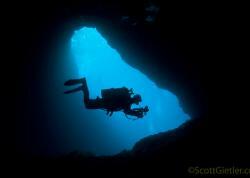 It was such a wonderful dive spot and I'll be going back next year after brushing up my skills!